These conditions simulate those which a product will typically encounter in the span of its useful life. Environmental test chambers evaluate a product’s quality and durability and identify potential flaws and malfunctions that exist either in product design or material choice before the product reaches the public market. Industries ranging from medical, construction, and automotive to consumer, food processing, and packaging use test chambers on everyday products such as car parts, cigarettes, makeup, medicines, and kitchen appliances. Products undergo this testing in certain environmental conditions, the findings allow for production adjustments by the manufacturer and result in a better quality product arriving on the market. Common procedures recorded in test chambers include the effects of extremes of temperature and sudden variations of temperature in temperature chambers and cryogenic chambers, the effects of humidity and moisture in humidity test chambers, and salt spray tests which record the degrading effects of salt water and corrosion-resistance of objects for manufacturer analysis. 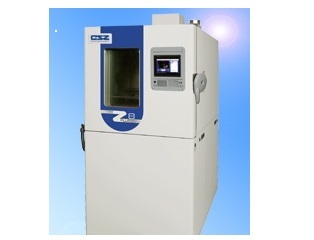 Other types of test chambers include AGREE chambers, altitude chambers, thermal shock chambers, and vacuum test chambers. The design and construction of the test chamber has to be carefully considered. As it is a process test, test chambers need to have a means of viewing and monitoring the testing procedure either through a viewing hole or through a video feed. In some cases, an environmental test chamber will have a “reach-in” capability in order for the testing engineer to handle the product or material being tested. The method of process control is another consideration to be undertaken as control panels can be either analog or digital, fed by a computer or the web, etc. Environmental test chambers are designed with the capacity to replicate extreme environmental conditions. Temperature chambers can typically reach temperatures above 1000 degrees Fahrenheit, and cryogenic chambers produce temperatures on the other end of the scale achieving lows of -200 degrees Fahrenheit, or even lower with the help of liquid nitrogen. In addition to temperature variations which can be further tested by thermal shock chambers, humidity and air moisture content can be replicated with humidity ranging from 10-100% in most humidity chambers. Altitude chambers simulate extremely high altitudes to test the effects of pressure and air change, and routinely 10-8 Torr levels are achieved in vacuum environmental chambers. Test chambers have to be carefully constructed in order to achieve controlled and consistent testing. Test Chambers Test chambers reproduce environmental conditions within a contained space for the purposes of evaluating the long-term effects of specific changes upon objects such as industrial products, electronic products, and other components.